Develop a website using Web Shell. Personalize your website with your own domain name & e-mail address. SiteLock security scan, accept PayPal and more! Do you have the know-how to develop a website on your own? We have more than 10 years of domain management experience, which makes it a snap for you to buy and manage your domain name through us. You get a free domain name when you subscribe to THE Plan. 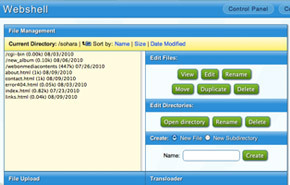 Alternatively, you can buy a domain name now and add web hosting services later. Your domain comes with a tools to protect your personal info, a generous number of subdomains, domain forwarding, domain transfers for domains you already own and auto-renewal for your domains. 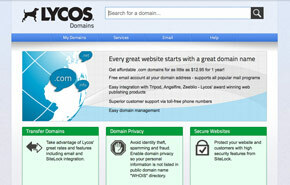 Also, every Lycos domain automatically comes enabled with our powerful webmail platform. When you sign up for THE Plan you get 20 e-mail accounts, 1GB of storage per account, 20 e-mail forwards and our catch-all e-mail service. Angelfire offers a variety of services for our website owners. Whether you're using our website builder or the Angelfire Web Shell...these additional services enable you to take your website to the next level. Protect yourself against scammers and junk mailers. You can create a PayPal business account and start accepting credit cards on your website in a few easy steps. Read our getting started with PayPal page for more information. The industry's best-known and most user-friendly newsletter management service helps you stay in touch with your website's visitors. If you operate a business, e-mail newsletters are a great way to get closer to your customers.